5 pets to save and 13.500 points to gather, are the requirements to beat this level. Whatever you need to beat the level is at your dipsosal: Two balloons and the rocket booster that gets activated while clearing the blocks will help you to clear the blocks under the pets and “drive” them to the bottom of the screen. 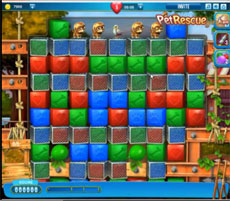 If you can’t pass Pet Rescue level 17 you’ll possibly need to watch our walkthrough video.